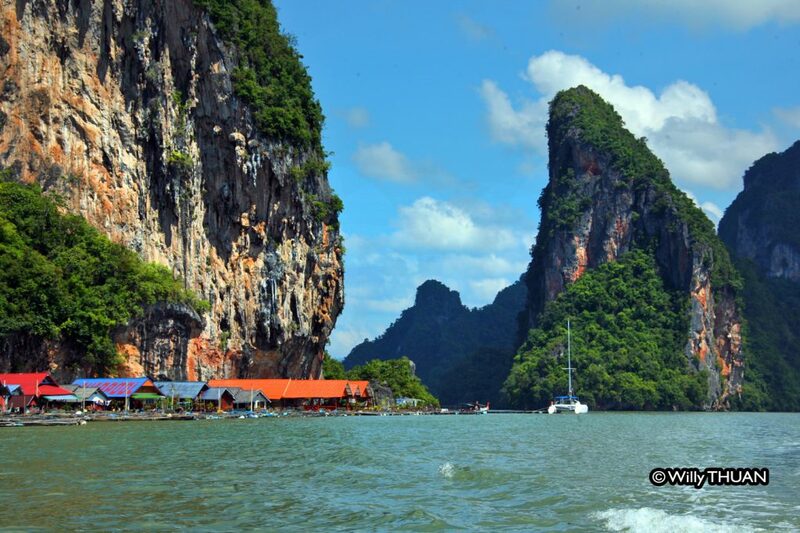 What is Koh Panyi Village? 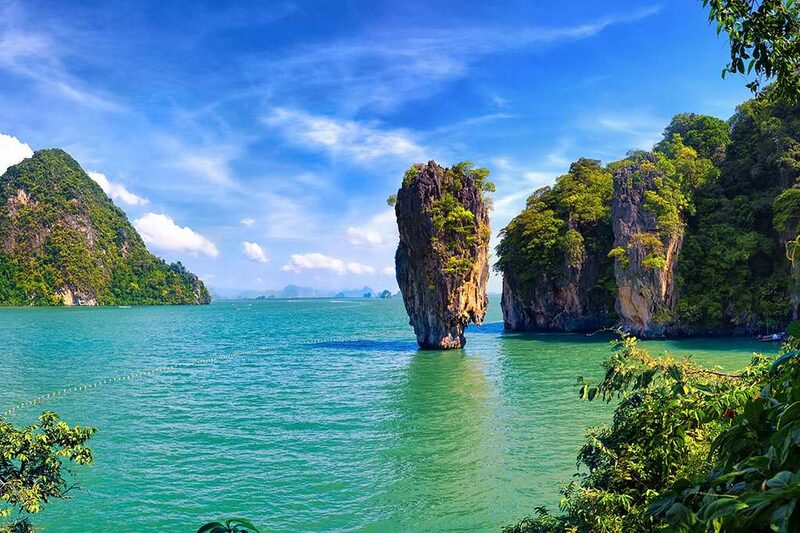 Koh Panyi (Koh Panyee) is a surprising village almost entirely built on stilts in Phang Nga Bay near the famous James Bond Island. 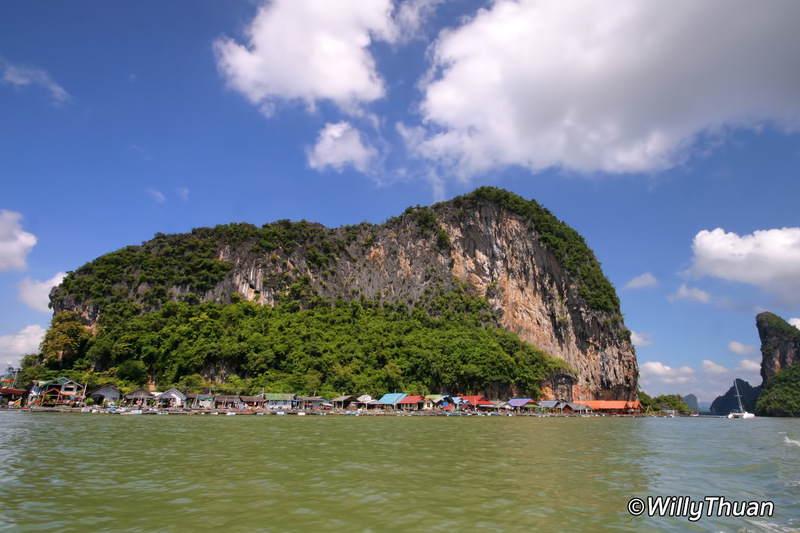 Koh Panyi is a very unusual and exciting site to discover, but it can be hectic, especially at lunchtime because of the many seafood restaurants welcoming all the visitors. The trick is to get there early and be the only visitor in the village! 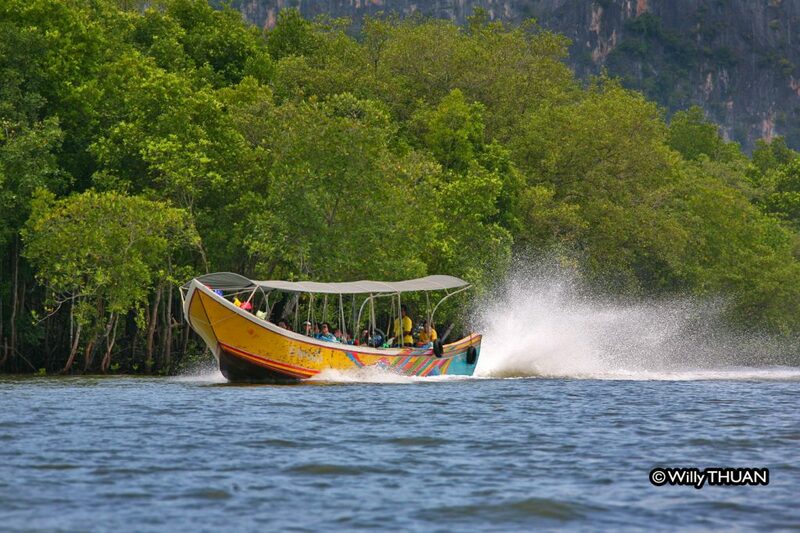 If you want to have Koh Panyi almost for yourself, rent a car and drive early to the Surakul pier in Phang Nga, then rent a longtail boat which will take you there within 20 minutes. 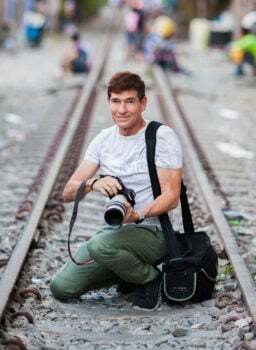 It’s not cheap, maybe 1,500 baht, but it is worth it if you want to have a lot of time in front of you to take photos of Koh Panyi with no tourists on them, and most important, have a different vision of this very unusual place. Even the boat ride itself is fascinating, gliding through the mangrove and between colossal limestone rocks. Circling the village gives you an excellent idea of its size and shape. You will then disembark at the main piers, where a dozen seafood restaurants get ready for their busy lunchtime. Since you will still be there at noon, try it anyway: despite being a tourist attraction, Koh Panyi remains a real fishing village, and they serve a pretty good Tom Yum Goong. 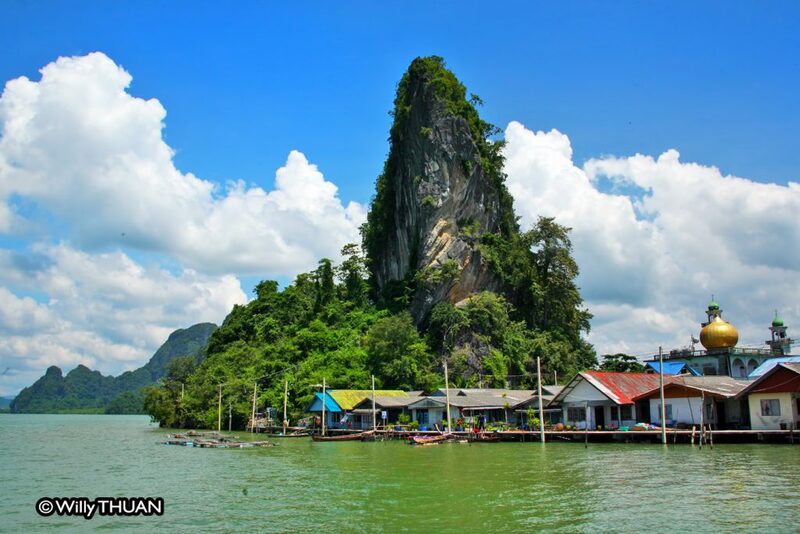 Koh Panyi (flag island) is a Muslim village built on stilts about 200 years ago at the feet of a giant limestone cliff. Only a tiny part of the village is on solid ground (where the mosque is) the rest just grew from there and slowly continues to grow. The central part of Koh Panyi is a concrete floor connecting dozens of tiny souvenir shops, and from there, a narrow maze of uneven planks lead to the population’s houses. 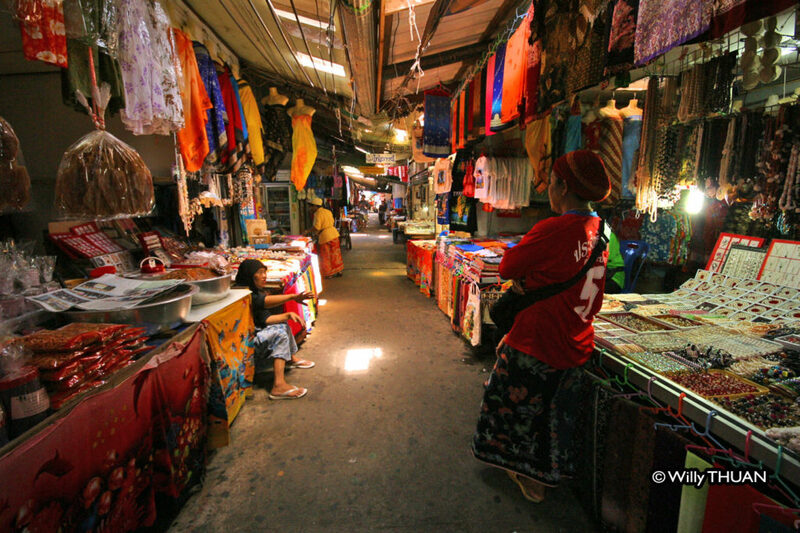 Start exploring and you’ll get easily lost in the network of walkways and tiny shops, all selling tee shirts, batiks and stuff made of shells. I guess some people buy those. Once you start walking away from the centre, space opens up between wooden houses, corrugated iron or a bit of everything, and you can see a bit more the sea and the sunlight. Koh Panyi is a complete village with a school, police station, a tiny health centre and of course the mosque. Living space is amazingly scarce, but people are used to it. Tourists have been photographing the locals so many times, they barely acknowledge your presence. So unless you show some signs of buying something, they will keep going their daily lives right in front of you: eating, sleeping in hammocks, cleaning, cooking and chatting. It’s a bit odd to witness their every move, directly inside their house. The school is no different… kids do have classes in there and it became part of their daily life to be photographed all day long by a bunch of not so respectful tourists. Just try to imagine yourself in the same situation at your school, would feel weird, wouldn’t it? 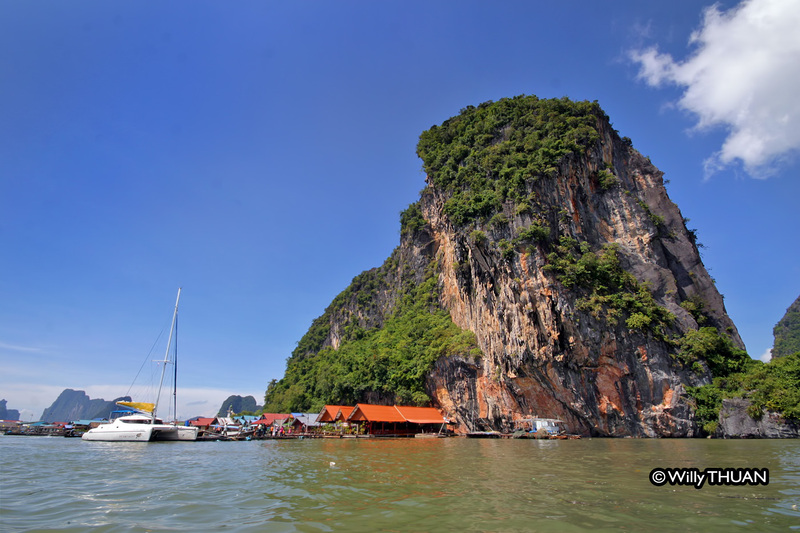 Koh Panyi is full of life, full of colours, lights and smells, offering plenty of photographic opportunities. And it’s still unique, but you’ll have to be talented to come up with a photo no one has taken before!